02-Nov-2012 -- This was a fun (and easy) confluence point. To date I have visited several confluence points in US National (and State and City) Parks, and several confluence points in US National Forests, but this is the first time that I've visited a confluence point that lies within an official campground within a National Forest. 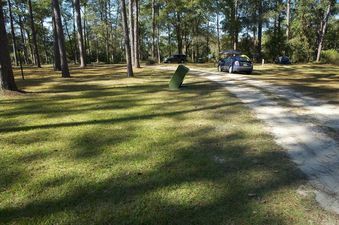 Specifically, this confluence point lies within the Wright Lake campground within the Apalachicola National Forest - near the bottom of Florida's 'scrotum'. After first visiting Saint George Island on Florida's Gulf Coast, I drove north through the Apalachicola Forest. A short detour took me to the campground. #1: The confluence point lies in this campground!